Torque / load sensors will play a progressively significant role in many applications, in accordance with its numerous benefits such as cost effectiveness and well defined infrastructure for serial manufacturing. They support critical benefits such as efficiency enhancements, operational safety, weight savings, improved productivity, and cost savings. Magneto elastic torque sensors, being truly non-contact based, have intrinsic advantages over outdated solutions based on strain gauges in terms of cost structure and robustness. Recently, manufacturers have developed feasible, commercially proven substitutes in a number of industrialized sectors with demanding requirements. The market is projected to expand at a CAGR of 9.9% during the forecast period and reach US$ 225.68 Mn by 2026. Demand for accurate torque measurement solutions is increasing in a phenomenal manner and supporting the huge growth potential of torque sensors. Also, rapid progress in industrial manufacturing, as well as research and development requires higher standards of accuracy for all measuring instruments. Hence, industrial test systems need to get more & more reliable and accurate in sync with industrial development that has taken place in recent years. Current trends in the torque sensor market such as e-mobility and reducing emissions of combustion engines has strengthened the market for higher precision in dynamic torque measurement devices. Furthermore, increase in mechanical output, improvement of efficiency, conservation of energy resources, and reduction in environmental pollution are all gaining importance in the magneto- elastic torque sensor market. Magneto elastic sensors have evolved as a viable alternative to strain-gauge systems, especially in volume production of more price-sensitive equipment. The compelling advantage from a technology perspective is that magneto elastic sensors have cost structures that make them compatible for mass production. An existing component is converted to the primary force sensor only by magnetic encoding. This process does not add any material cost, but merely represents a processing step which can be done within seconds. As a result, there is typically no extra material cost entailed in manufacturing. This is anticipated to have a positive impact on the overall global magneto elastic torque sensor market. Since magnetization needs to last for several decades, the selection of suitable metals is somewhat limited in case of magneto elastic torque sensors, which is anticipated to indirectly hamper the market. Many steel alloys commonly used for mechanical parts such as gearboxes or driveshaft fulfill these requirements. Torque sensors have been used in frequent applications in the automotive industry. Rotary torque sensors are used for strain measurement, testing of the clutch & gearboxes, and dynamic torque within the engine. Moreover, powertrain, brake, and suspension systems are being tested using torque sensors, which are also used to measure horsepower to improve fuel efficiency. Many automotive manufacturers use the in-vehicle torque sensors for mapping the engine torque and calibrating automatic transmission. Furthermore, torque sensors are also being used in fleet & customer-use testing so engineers can collect the data under ordinary or extraordinary conditions. Attracted by this expanding market and underlying latent demand, several players are expanding their business through strategic mergers and acquisitions and partnerships with end-use industries.In September 2017, Kistler Group acquired Corrsys-Datron Sensor system GmbH. This acquisition enables Kistler to round off its range of measuring systems for vehicle dynamic testing in automobile development. 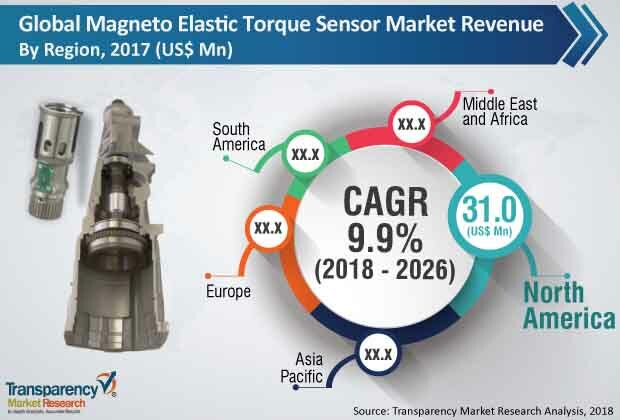 Some of the prominent players identified in the magneto elastic torque sensor market include ABB Ltd, Applied Measurements Ltd., Crane Electronics Ltd, Honeywell Sensing and Control, HITEC Sensor Developments, Inc., Kistler Instrumente AG, MagCanica, Methode Electronics, and Texas Instruments, Inc. This comprehensive report by Transparency Market Research analyzes and forecasts the magneto elastic torque sensor market at the global and regional level. The report provides analysis over the period 2016–2026, wherein 2018 to 2026 is the forecast period and the base year is 2017. An in-depth and unbiased market assessment has been made to offer readers in-depth and accurate analysis. The report highlights all the major trends and services playing a key role in the growth of the magneto elastic torque sensor market during 2018 - 2026. It also focuses on market drivers, restraining factors, and opportunities of the magneto elastic torque sensor market during the said period. The study provides a complete perspective about the market throughout the research study in terms of value (in US$ Million and Million Units) across various geographies, including Asia Pacific, South America, North America, Europe, and Middle East & Africa (MEA). The report includes a detailed value chain analysis, which is focused on providing an extensive view of the global magneto elastic torque sensor market. Porter’s Five Forces Analysis is also provided in the report to understand the competitive scenario in the market. The study incorporates market attractiveness analysis, wherein the market segments for application are benchmarked based on their market size, growth rate, and attractiveness in terms of opportunity. In order to offer a complete analysis of the overall competitive scenario in the magneto elastic torque sensor market, every geographic region mentioned in the report is provided with attractiveness analysis.